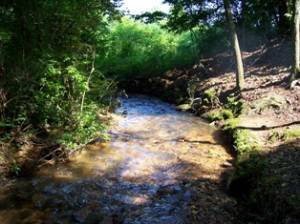 Hear The Creek Sing On This 1 1/2 Acre Private Property! Just imagine...you're in the north Georgia mountains, you're sitting on the deck at an awesome cabin, you're looking down at the long creek winding one way and then another, you're hearing the creek sing its many sounds, you're smelling the grub you've got on the grill...if you like the sound of that dream, believe us, it can happen here at CREEK'S SONG CABIN! Creek's Song Cabin is located just six miles south of Blairsville, Georgia off of the famous curvy mountainous Highway 129. 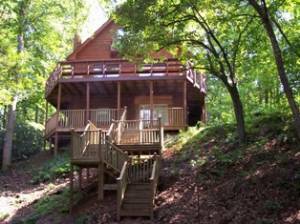 The cabin is a tri-level house that has just been completely renovated from top to bottom. Inside the cabin you'll find newly painted walls, a beautiful pine tongue & groove ceiling, new furniture & appliances, great burning gas logs, and much, much more! Outside you will find decks, decks, and more decks on which to enjoy the 400 feet plus of creek. Believe us when we tell you that you can hear the creek sing from anywhere on this acre and a half of private property! If you can manage to drag yourself away from this awesome cabin for a day of outside activities you can take a scenic drive to some of the area waterfalls, or if tubing and horseback riding are your thing, they are not far away. With the Appalachian Trail and Vogel State Park ten minutes away, you can either hike or swim, or take a short ride west on Hwy. 515 and ride the train through the mountains. Travel north a short distance and do a whitewater rafting day, or go south and tube down the river. Easily accessible, this cabin is now available for your vacationing pleasure. You'll just have to see it to believe it! Waterfalls, train ride through mountains 30 minutes away, whitewater rafting 30 minutes away, Helen and Dahlonega 40 minutes from cabin, Vogel State Park 20 minutes south. Cabin with multi-level deck leading down to creek area. Watch and listen to the creek as it winds and sings! 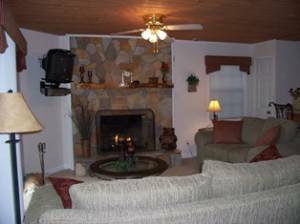 Brand new furniture,stone fireplace w/gas logs, & television. 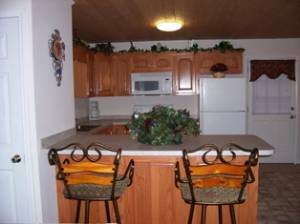 Brand new appliances, built-in microwave, range & refrig. w/ice maker & filtered water. Brand new King size bed. Glass door opens onto deck. Just open the door and listen to the creek sing! 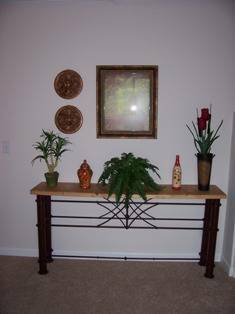 Located next to master bedroom downstairs. We stayed here in October 2005. This is a very beautiful cabin with plenty of space and everything that you could possibly need. 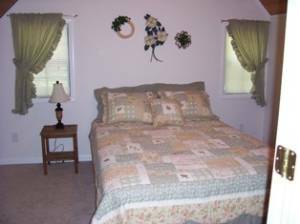 The owners have recently completely renovated the cabin and have done a wonderful job. Janice McPherson-the owner, is a wonderful person to work with. I actually booked with her 5 days in advance of my stay and she got me everything that I needed very efficiently. 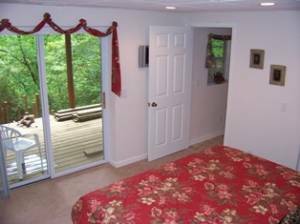 I think that the prices are very reasonable compared to other cabins in the area. I will definitely stay here many times in the future. Rates are for two people. 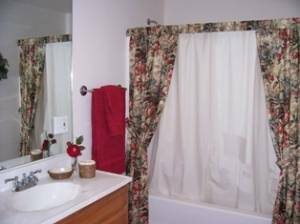 $10.00 each additional person per night. Weekly rate of $650.00 is for two (children under 12 are free)and covers six nights, leaving on seventh day. Call for additional rates. Deposit: $100.00 deposit required to hold reservation. Balance due 2 wks. prior to arrival. Cancellations and Refunds: Refund of deposit or payment only if cancellation made two weeks prior to arrival.